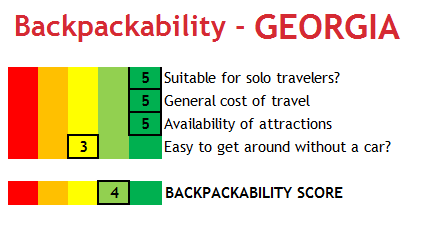 Adventures of Elis: A Backpacker's Guide to GEORGIA. ‘Where’s that?’ was the most common thing people asked me when I told them I’d be visiting Georgia. ‘Is that in America?’ others would ask. Whilst an American state goes by the same name, my adventure was in fact headed in the opposite direction. Georgia is a part of the Caucasus region– a small and diverse cluster of nations squashed between Russia and the Middle East. This incredible and rarely-explored country straddles the cultural and geographic boundary between Europe and Asia, showcasing the best of both worlds. I gazed in awe from the plane window as the seemingly endless sun-baked grasslands and distant rocky peaks drew closer; the country felt different from anywhere I’d ever been before right from the start. Passport control was quick and easy and the bus journey into the city cost pennies. The trip was off to a good start. 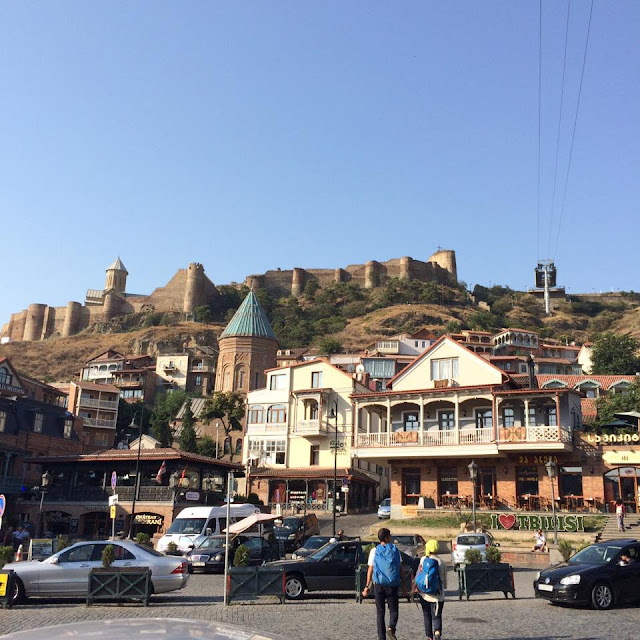 My adventure began in Tbilisi, the Georgian capital. It’s is a fascinating place to explore - so many influences fuse together to shape this city into the cultural and architectural patchwork it is today. Pretty buildings with colourful, wooden balconies hug the Medieval fortress in the oldest part of the city, whilst grand European-style boulevards dominate the newer neighbourhoods of Rustaveli and Marjanishvili. The Soviet influence is most notable in the suburbs, with the characteristic and uninviting ‘grey belt’ of apartment blocks. A good place to start exploring is Tbilisi’s old town. Take in the uplifting atmosphere and historic landmarks then cross the Mtkvari River via the futuristic ‘Peace Bridge’. From here, you can take the cable car (for 2 GEL each way) up over the city to the Narikala Fortress and the imposing Mother Georgia statue. From up here there are panoramic views over most of the city. On the other side of Tbilisi, it’s worth walking up the hill to see the impressive Holy Trinity Cathedral. Georgia is a deeply religious country – around 86% of the population identifies as Eastern Orthodox Christian. 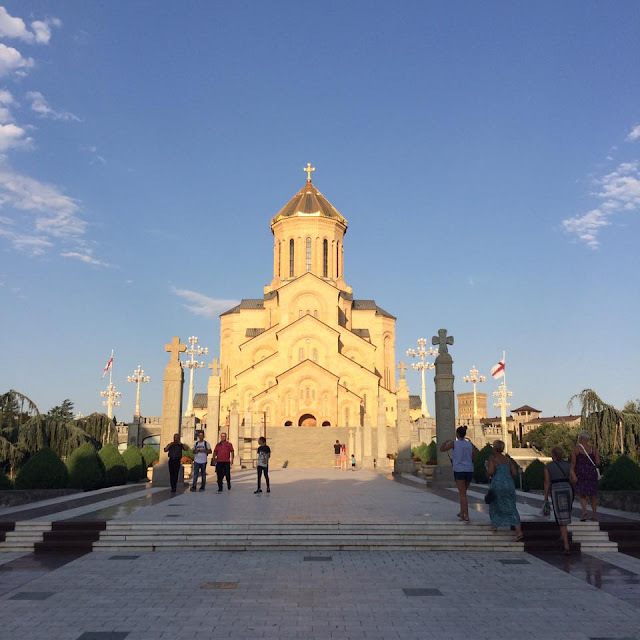 It would be difficult to fully experience Georgian culture without visiting some churches – they’re all so beautiful. Crossing over to the newer part of the city, you’ll come to Freedom Square, which is essentially the city’s beating heart. Rustaveli and Marjanishvili are home to most of the major shops and theatres along with some of the city’s grandest architecture. Perhaps the nicest thing about Tbilisi is the fact it’s not completely overrun by tourists. 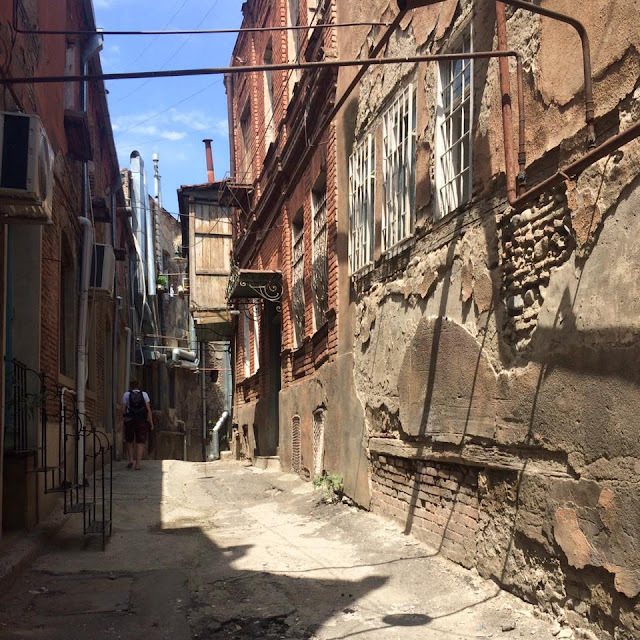 It lacks the pristine feel of the western world; it’s gritty, chaotic and parts of the city are in disrepair. It’s a ‘real’ working city which gives a truly authentic view into life in this part of the world. It’s also one of the friendliest places I’ve visited – I found the Georgian people very welcoming and hospitable as well as being deeply patriotic. Undoubtedly the easiest and most popular day trip outside of Tbilisi is the ancient UNESCO-listed town of Mtskheta, the ex-capital of Georgia. Mtskheta is one of the most important spiritual centres of the South Caucasus. 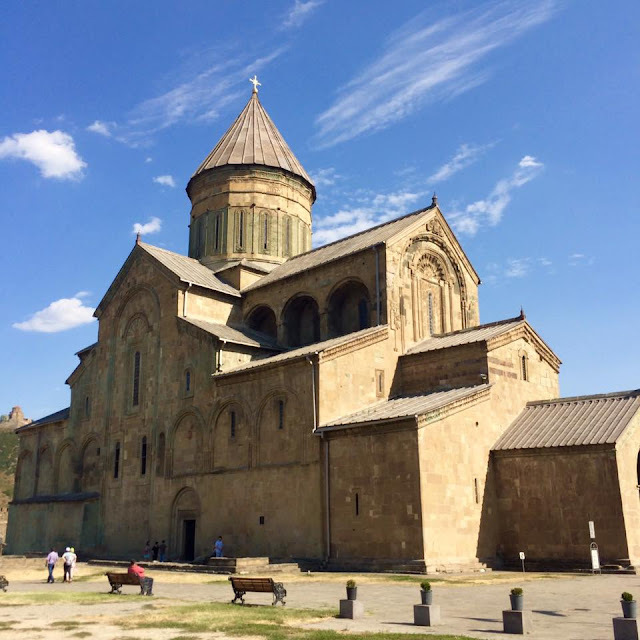 The Svetitskhoveli Cathedral and Samtavro and Jvari monasteries are fantastic both inside and out. It’s such a peaceful place. The 6th century Jvari Monastery clings to a hilltop above Mtskheta, giving amazing views over the town and surrounding countryside. 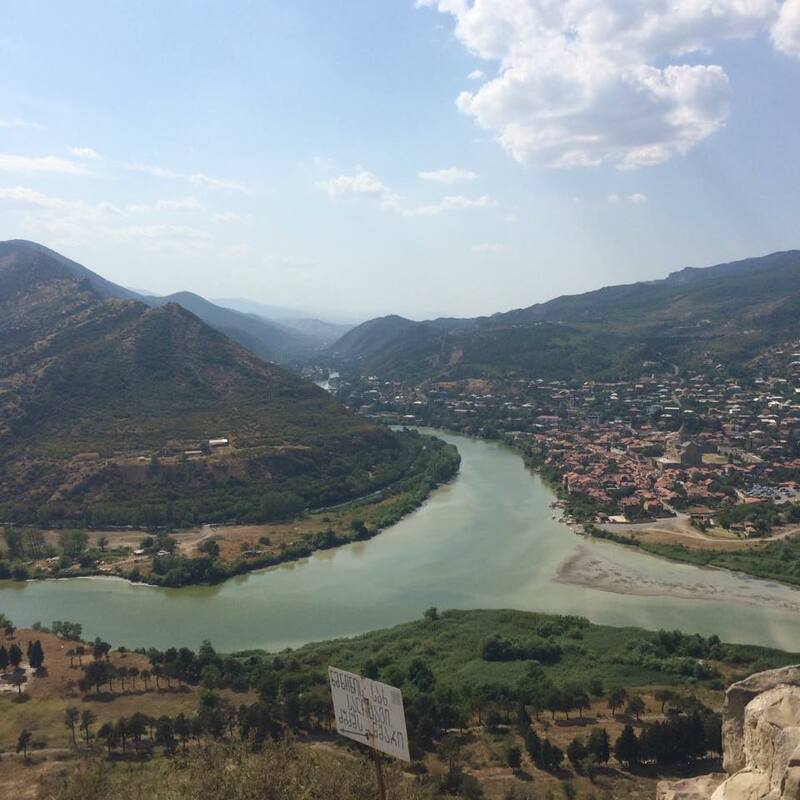 The easiest and most informative way of seeing Mtskheta is through an organised tour from Tbilisi – these generally run for half a day and should cost around 25 GEL (when I visited, 10 GEL = 3 GBP). For the more adventurous, marshrutky (local buses without set routes) travel between Tbilisi (outside Didube Metro station) and Mtskheta several times a day and cost around 1 GEL. Whilst public transport is unfathomably cheap, it can be difficult to use as destinations are usually shown in the fabulous squiggly letters of the Georgian alphabet (and occasionally in Cyrillic). Few drivers will speak English. Georgia is a beautiful country with so much to offer its visitors. There’s both ancient and recent history, pretty towns, great food and friendly people just to name a few. 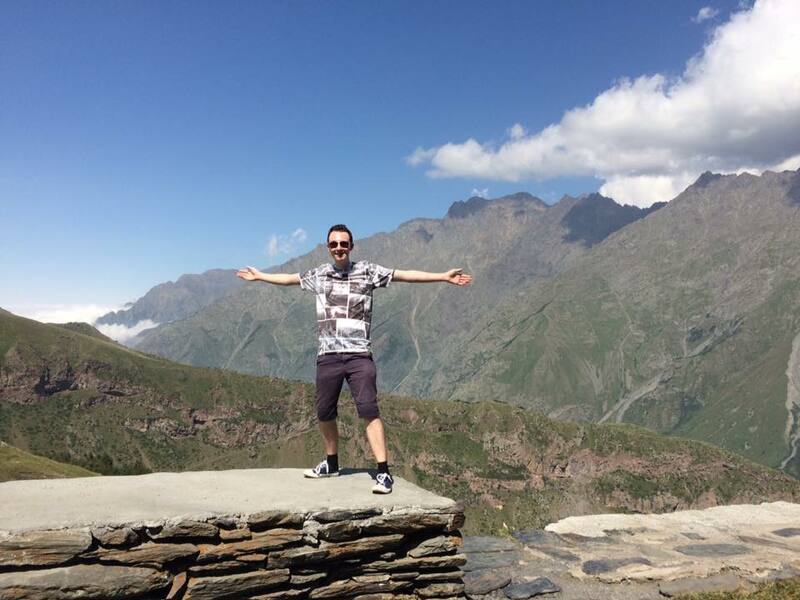 But the absolute highlight of my trip was the stunning natural landscape. 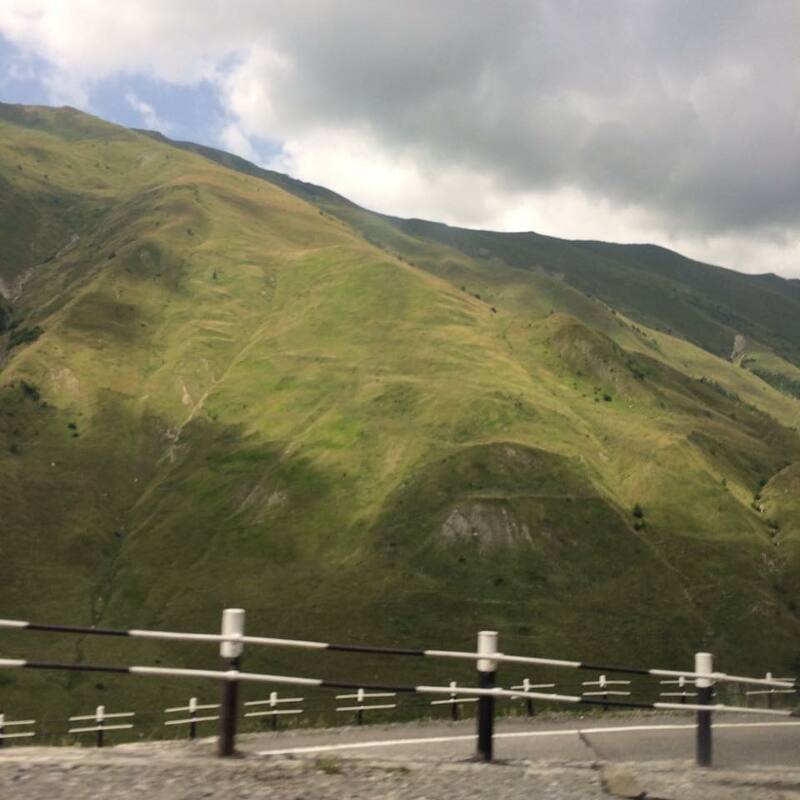 The Greater Caucasus mountains are natural beauty on a scale I’ve never seen before. These mountains are colossal - rugged peaks poke up to 5068 meters into the sky. It quite literally took my breath away. I took a group tour which followed the Georgian Military Highway from Tbilisi to Kazbegi, stopping just short of the Russian border. Once outside of the city, the scenery along the entire route was utterly spectacular. 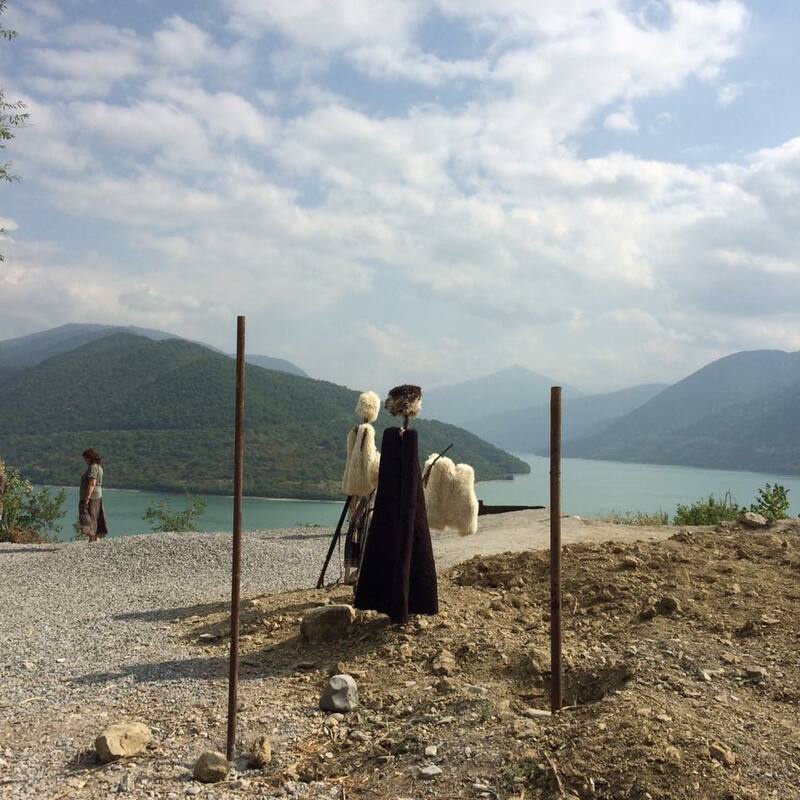 The route passes the fairytale fortress of Ananuri before climbing high into the Caucasus range. As the road climbs to an elevation of 2379 meters, the landscape transforms quickly from scrubland, to forest to steep, bare slopes. 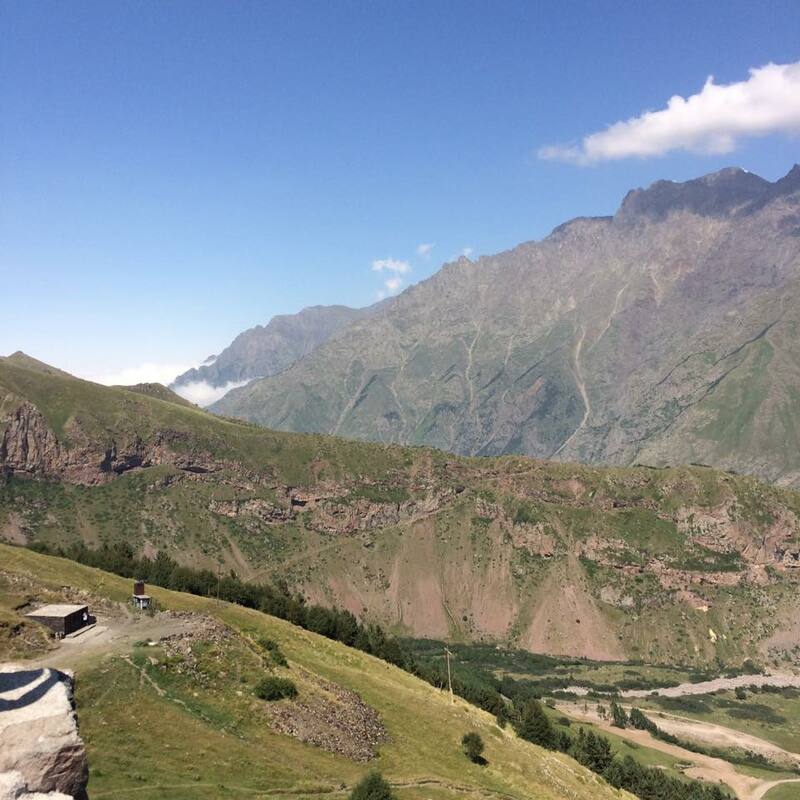 The views become more and more spectacular the closer you get to Kazbegi – the mountains get taller and taller. From Kazbegi, we took a jeep up to the Gergeti Monastery. If you’ve ever seen a picture of Georgia, it was probably taken here. This beautiful monastery is a sanctuary of peace, nestled at the foot of the 5033 meter giant that is Mount Kazbek. 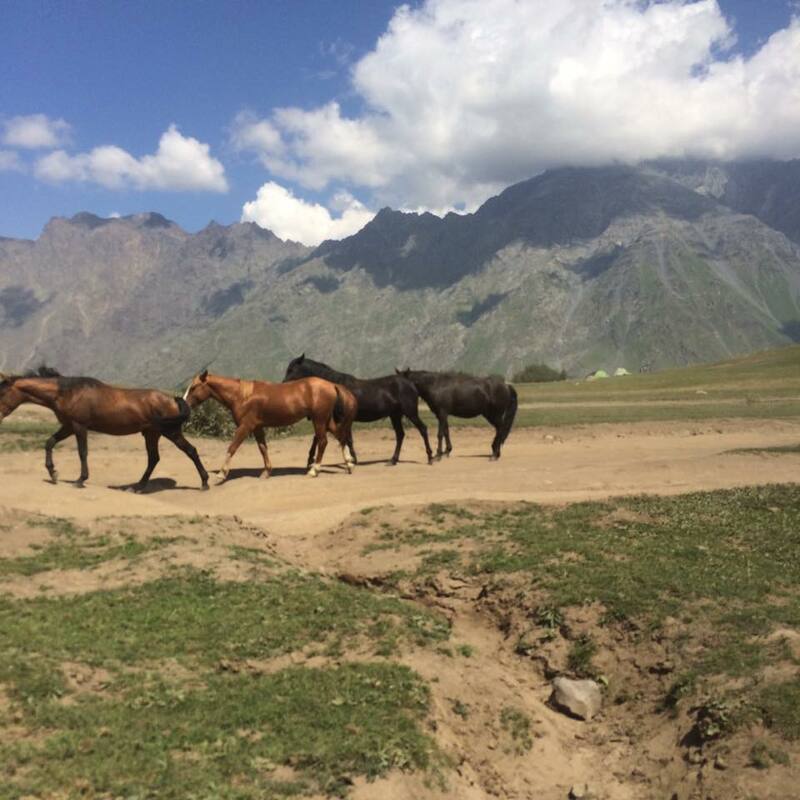 Gergeti feels like the roof of the world – the beauty of the place is outstanding. Georgians will often tell you that their country was the birthplace of wine. Whilst the sincerity of this claim is up for question, I did really enjoy the wine here. There are a little under 400 grape varieties grown in Georgia, so there are a lot of wines to choose from. Those with a particular interest in Georgian wines may like to visit the Kakheti region where most of the vineyards are found. I didn’t have time to visit Kakheti on this trip but there are lots of organised tours from Tbilisi. Low prices and a weak currency make budget travel exceptionally easy in Georgia. A bed in a shared hostel dorm should cost between 10 and 25 GEL per night - this usually includes breakfast. The cheapest hostels can be very basic. Food is also extremely affordable – expect to pay around 15 GEL for a main course in a mid-range restaurant in Tbilisi and slightly less off the beaten path. Flights to Tbilisi can be hard to come by, with most connecting in Ukraine or Turkey. Georgian Airways have, however, just started a new direct route to London with two flights a week. It amazes me that this beautiful and fascinating country attracts so few travellers. It has everything you could wish for in a destination – ancient history, spectacular landscape, low prices and friendly people just to name a few. But it still manages to slip under the radar. But maybe this is what makes the place so special – it’s undiscovered. Have you been to Georgia or thinking of visiting? Let me know in the comments section below! Thanks for reading!